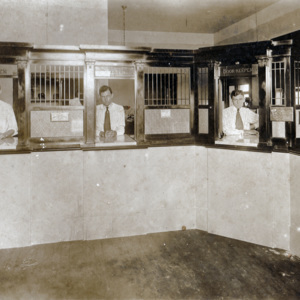 This photo is believed to show the Farmers and Merchants Bank, corner of Broadway and Railroad Avenue, circa early 1920s. 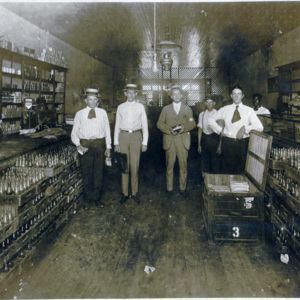 Photo shows Sylvester Briley Poston, businessman and first mayor of Johnsonville, in one of his stores. others have yet to be identified. 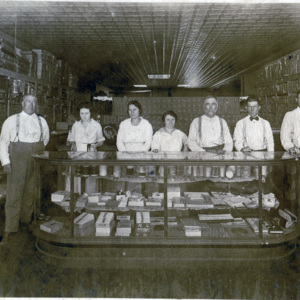 Percy Poston stands center holding a can in a Broadway store in Johnsonville, circa 1920. S.B. 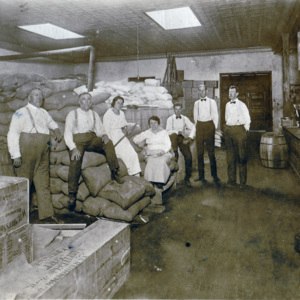 Poston (left) stands in a store with other workers. This was most likely in the "Poston Block" - a group of stores and businesses at the Northwest corner of Broadway St. and Railroad Ave.